WHEN IT COMES to recommending the best strategy for growing high-yielding soybeans, the advice Horst Bohner is likely to give is “it depends”. Bohner, soybean specialist with the Ontario Ministry of Agriculture, Food and Rural Affairs, isn’t being evasive; it’s just there are too many factors to consider to provide a simple ‘one-size-fits-all’ recommendation that would be applicable to all farmers across the province. The combination of new varieties, available nutrients, and protecting the potential of the crop through timely application of inputs all play a role in determining the eventual yield from a field. Location, weather, disease pressure, water holding capacity, and soil heath also influence yield. However, Bohner is very optimistic that yield gains of five bushels per acre (bu/ac) are achievable in most fields and even 10 bu/ac in some fields when yield limiting factors are addressed with the latest technology. Field research suggests there are a few key elements to consider which will help you gain those extras bushels per acre. One area of research has looked at whether early season stress, such as land rolling after emergence, will help stimulate branching, pod number, and yield. The results they have seen so far do show a small increase in bushels per acre, however, there haven’t been enough studies to prove rolling will provide a consistent benefit. Bohner says they haven’t yet been able to rule out a year effect or a variety effect for the results they’ve seen. What they have determined is that tilled fields will sustain more damage than those under no-till. Bohner says that’s because corn residue left on fields keeps the roller up a bit higher and prevents the emerging soybeans from getting completely flattened. Another key factor in seeing a benefit from rolling is getting the timing right. You can do more damage than good if you roll when the field is too wet. You also need to roll at the right growth stage to ensure the soybean plant recovers. Time of day also plays a role. “You can roll after soybeans come up as long as you are in that first to second trifoliate. You don’t want to go too early because you can break off seedlings and you don’t want to go too late because you can break off the stem at the ground,” says Bohner. In many soybean fields, particularly in eastern Ontario and in parts of southwestern Ontario during wet years, white mould is a significant yield limiting factor. In soybean fields with a history of white mould, a foliar fungicide should be standard practice. Studies have shown that an early application is very important for suppression, and two applications show the best results. Research has also been done into whether a foliar fungicide can improve yields even if white mould isn’t a major concern. Bohner says they know there is often a yield response of up to five bushels when two applications are applied at the R2 and R3 stage, but they are still trying to solidify an answer on whether to expect those responses year in and year out. Bohner says if you have white mould there is no question you should spray. If you don’t have a white mould problem, consider other factors such as whether other diseases are present, what your yield potential is, and how often soybeans have been planted in the field in recent years. A greater response to fungicide application is seen in fields that have a lot of soybeans in the rotation. And ultimately, the weather or market prices could make the decision for you. Bohner’s field work has also looked at what makes the difference between a big crop and a normal crop by looking at the plants themselves. He has found that the pod number per plant is the main difference and is now trying to determine what influences pod number. Bohner sites long term phosphorus (P) and potassium (K) studies that show when soil fertility is low there is no question you have fewer pods and take a yield hit. And so he is asking if that relationship is true — will yields increase significantly if soybeans are given extra nutrients in a field with normal soil fertility? Bohner says what they have shown so far is that building soil test values to reasonable levels will yield about four bu/ac more than simply applying fertilizer to soybeans in a given year. Sulphur is another input that is being investigated by industry researchers. Bohner says one study in eastern Ontario in 2017 showed that applying sulphur on sandier soils was a good management decision. However, on loam and clay soils there wasn’t much of a yield improvement. 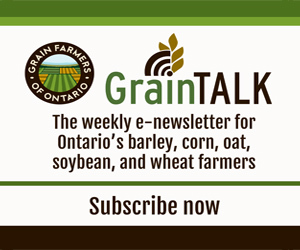 Bohner says that overall, soybean yields are increasing about .35 bushels per acre per year in Ontario but almost all of that is due to improved genetics. He says we have the technology available to move the provincial average of 46 bushels per acre to 50 bushels per acre within the next few years. This would include farmers utilizing the best varieties, the right nutrients, and the right timing for disease control. “I have seen growers significantly increase their farm averages over just a few years by using the latest varieties, increasing fertility, and using foliar fungicides at the appropriate time. It’s not easy to change soybean, yields but it certainly is possible,” says Bohner.